C&C Landfall 38 – Which Sailboat? Today, the C&C Landfall 38 is a fantastic 38 foot cruiser, if you can get over it’s wood cored hull. 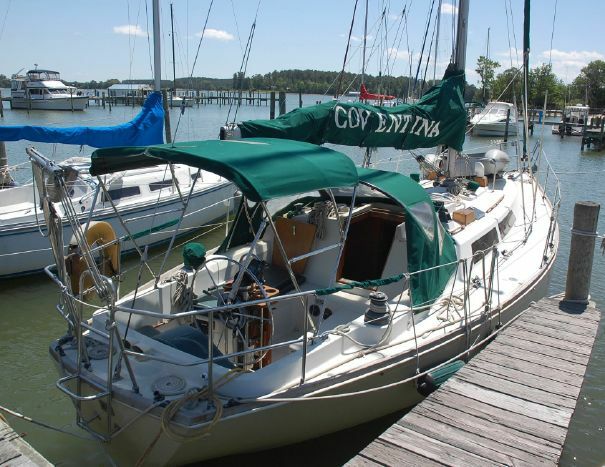 The C&C Landfall 38 is a masthead sloop designed by Robert Bell of C&C Yachts, built from 1979 to 1985. The Landfall 38 was designed for the cruising market and not for racing, which means that its design is only partially flawed by the influence of racing rules at the time of its inception – she is somewhat pinched in the stern. Fortunately for buyers today, the boat was never very popular with cruisers who had difficulty believing traditionally racing-oriented C&C could produce a good cruising sailboat. Only 180 C&C Landfall 38s were built. The C&C Landfall 38 covers the bases with features and design elements requisite for consideration as a cruising boat today. Her mast is keel stepped. By modern standards, she has a longish fin keel. Some cruisers may eschew her spade rudder for a rudder protected by a skeg or the keel itself, but a spade rudder is at least sufficient for a class B boat. The combination of longish fin and spade rudder is a nice compromise resulting in a boat that both tracks and tacks well, can go to weather reasonably well, and makes little leeway. Her ballast ratio is 38.92%, which is slightly higher than most of today’s production boats. Combined with her 12′ beam, she is relatively stiff. 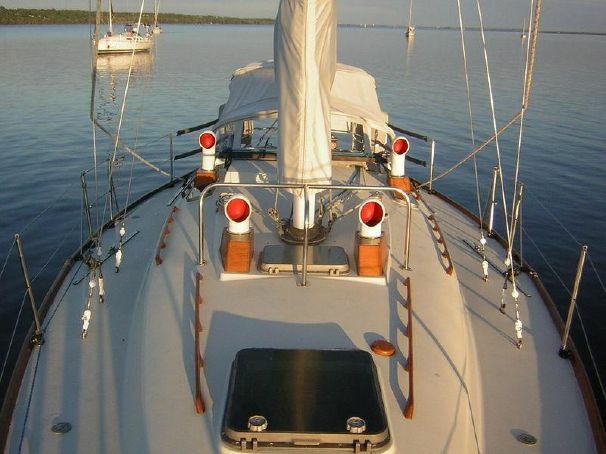 She has a 5′ draft, which is only 1-2′ less than most good sailing cruising boats, making her only a little less stiff but great for the Florida Keys or Bahamas. C&C Landfall 38’s displacement is 16,700 lbs. Her sail area to displacement ratio is 15.93, just putting her under the figure of 16 considered for cruiser/racer boats. Her length to displacement ratio is 271.48. Her pinched stern will make her less ideal for running downwind than a boat with beam carried all the way aft. The C&C Landfall 38 is an attractive boat. She has a nice sheer line with a teak toe rail, sleek and relatively modern looking deck house (resembles a Catalina, although missing additional port lights forward), moderately raked bow, wineglass-like slightly raked transom with a small counter cut-out just above the water line, and nice hull lines with slight tumblehome. From any angle, she appears nicely proportioned. Fit and finish on C&C Landfall 38s is top-notch. In addition, these boats were built when manufacturers still used solid wood instead of veneers, which goes to durability as well as overall appearance. There is some variance in interior wood choices and other accents. The original interior fabric choices appear to be rather conservative, resulting boats with original fabric not appearing particularly dated. 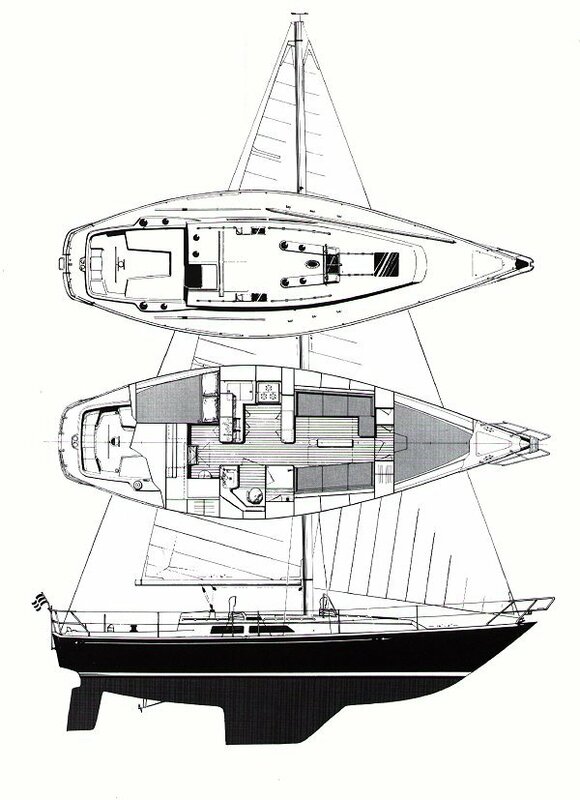 The best characteristic of the C&C Landfall 38 is her interior layout because it is unique and could be most functional to the right owner. Forward, there is a private cabin with a good-sized v-berth, good for 1-3 children or 1-2 adults. 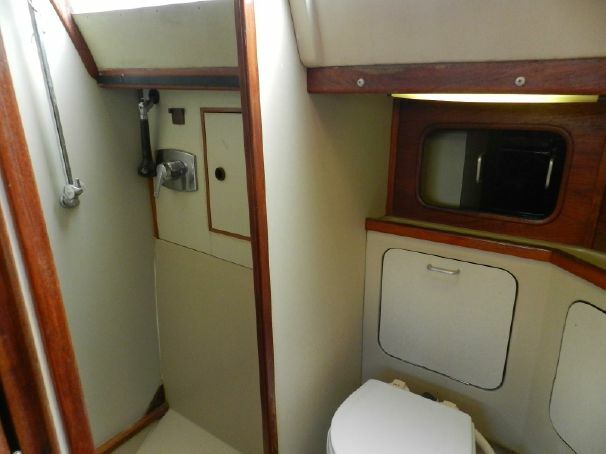 This cabin includes a bureau to port and a hanging locker to starboard. Along the hull above the v-berth are the typical small shelves. 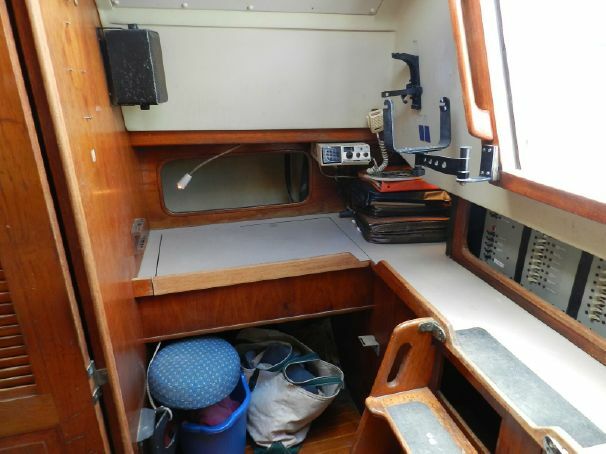 Aft of the v-berth, there is the main salon with port and starboard settees, and a drop leaf table that seats 4 very comfortably but could seat 6-7 with relative ease. There is ample storage in cabinets above the backs of the settees, behind sliding doors. 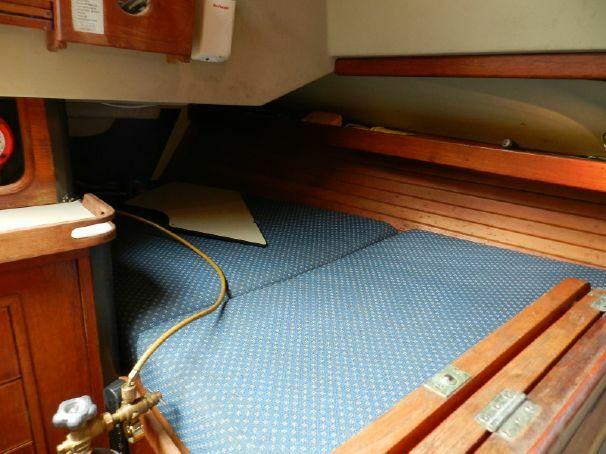 Additionally, some C&C Landfall 38s have a storage cabinet on the bulkhead separating the v-berth from the main salon. Hand holds run along the entire length of the cabin ceiling, port and starboard, in the main salon. Aft of these settees, to port is a relatively large U-shaped galley with near-centerline dual sinks aft with storage beneath, cold storage to aft and port, a gimballed range and oven outboard to port, storage in cabinets with sliding doors outboard to port. Some C&C Landfall 38s have additional storage cabinets above the sinks and additional counter space forward with storage beneath. Others have an odd cut out in the bulkhead above the sink into the aft cabin. Directly across from the galley to starboard is a large head with either a separate shower stall or a large linens closet. Most C&C Landfall 38s appear to have had the separate shower stall. There is storage behind the toilet, below the sink, and above both, all with either hatch or sliding doors. Having the galley and the head amidships is ideal for comfortable usage. 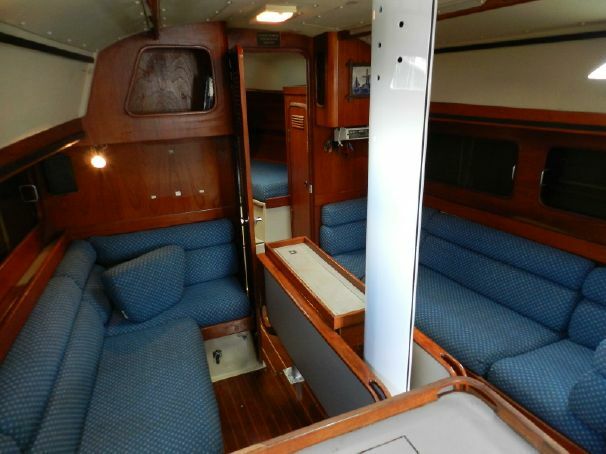 Having so much space dedicated to the galley and the head maybe ideal for liveaboards. Aft of the galley and head is the most unique and interesting aspect of the interior layout. This is the captain’s cabin, separated from the galley, head, and main salon by a bulkhead and door. 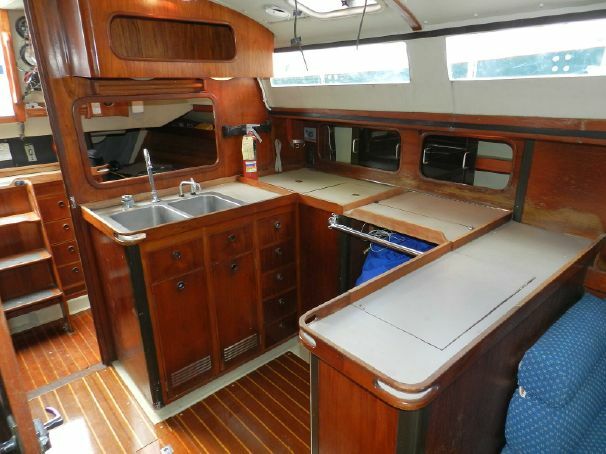 To port is a double quarterberth with nice storage cabinets or shelf outboard along the hull. To starboard is a navigation desk. In between, slightly offset to starboard is the companionway to the cockpit. There are storage drawers to port of the companionway ladder. Cruising families will immediately recognize that this arrangement affords the greatest safety with children. If mom and dad take the aft cabin in a C&C Landfall 38, they can easily watch the companionway, for both children wandering off and the unlikely intruder. For ventilation, the C&C Landfall 38 has one large opening hatch above the v-berth, one medium opening hatch above the main salon, one small opening hatch and dorade vent above the galley, and one small opening hatch and dorade vent in the head. The smoked port lights in the main salon do not open. Some boats for sale today have an additional 2 dorade vents installed forward. The cockpit on the C&C Landfall 38 is smaller than ideal for what is likely to be used as a class B boat today (Class B being used for coastal cruising or island hopping but not far offshore). It has a standard T shaped layout with wheel steering and relatively easy maneuvering around the wheel. The helmsman will be comfortable when heeled due to the humped seat behind the wheel. Others in the cockpit may not have as much comfort because the other cockpit seats forward of the wheel are not long enough for lounging. There is a lazarette beneath the starboard seats. On some C&C Landfall 38s, all sheets are led aft to pairs of winches on each side of the cockpit seats within easy reach of the helmsman making for easy single handing. On other boats, some winches are installed aft of the mast on the cabin top, making sailing with two or more preferable. The original C&C drawings for the Landfall 38 show two winches installed on each the side of the cockpit and four winches installed aft of the mast. If some boats have this configuration, it would offer the greatest flexibility for single handing and sailing with plenty of crew, enabling crew to spread out with some working outside the cockpit. It appears that there was some variance in the design of the cockpit coamings so that on some C&C Landfall 38s there is only room for one winch on each side, while others could support two. On all boats, two halyard winches rest on the cabin top to port of the starboard set companionway, and are easily accessible at the front of the cockpit, which is not far from the helmsman due to the small cockpit. The side decks on the C&C Landfall 38 are large, but the shrouds are set almost athwartships in the middle of them, which while not necessarily problematic, is less than ideal considering that moving the shrouds slightly inboard would make for an unobstructed walkway. There are ample hand holds along nearly the entire edge of the cabin house and a few more on the top of the cabin house amidships. The stern rail is split with a swing down swim ladder, which is easy to use due to the nearly flat transom and the presence of a small aft deck behind the cockpit. This configuration will also make boarding the C&C Landfall 38 when moored aft-to much easier than on most boats of this era, as guests and crew can walk around the wheel from outside the cockpit, rather than being blocked by it, before moving forward. Lifelines are not short and are supported by reasonably stout stanchions. Forward of the mast is a stainless steel grab rail. At the bow, there is a substantial pulpit and large anchor locker with windlass. The C&C Landfall 38 was powered by various Yanmar 30 hp diesel engines, which are reportedly sufficient for driving this hull. The engine is located beneath the cockpit. 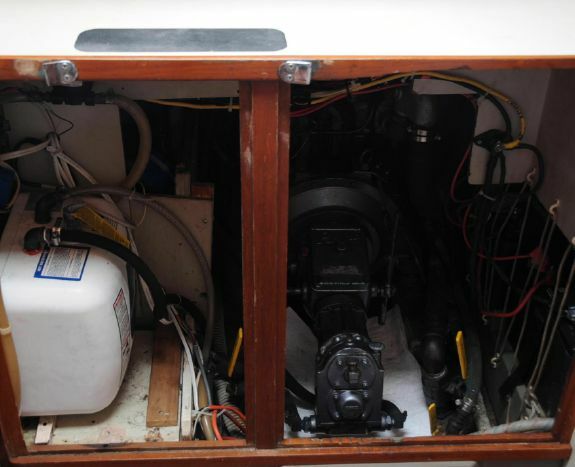 Engine access is behind the companionway steps and from the aft quarter berth, with no access from above in the cockpit. While this results in little room above the engine, there is little risk in water leaking from the cockpit onto the engine. Due to the placement of the engine beneath the aft cockpit, a v-drive gear is necessary. A significant design characteristic affecting the longevity of C&C Landfall 38s is the balsa cored hull. The hull of the Landfall 38, along with most C&C boats, was entirely cored with wood, even below the waterline. 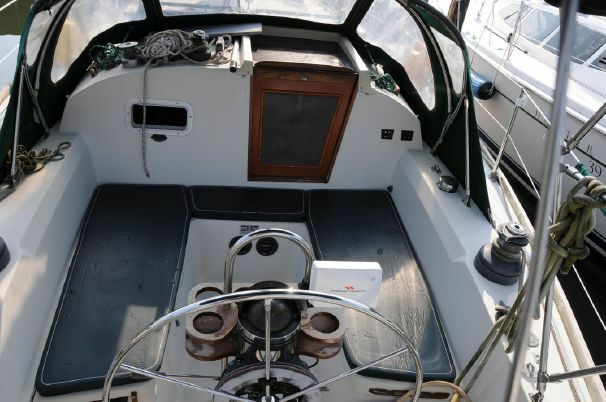 The wood coring is even continued around the through-hull fittings, unlike some other boats in which solid fiberglass is used around through-hulls to prevent leaks form destroying the wood core. Coring with balsa allowed C&C to achieve a stiffer hull with less weight. Achieving the same hull stiffness with fiberglass alone would have made for a much heavier boat. For performance, lightness is ideal, for longevity, balsa coring is a major caveat. Any leaks at through hulls or through the deck to hull joint could cause the structural wood core to rot, making the hull weak and likely to fail. However, other reviewers, including those cited below, indicate that there have been few problems with the cores on these boats. A thorough inspection of moisture in and delimitation of the hull should be a part of any survey before purchase. For C&C Landfall 38s, naval architect Jack Horner advises that the smoked port lights in the main salon, deck hardware fittings, and the deck to hull joint can present persistent leaking problems. Others indicate leaking around the mast passing through the cabin top, which of course is common for keel-stepped masts. 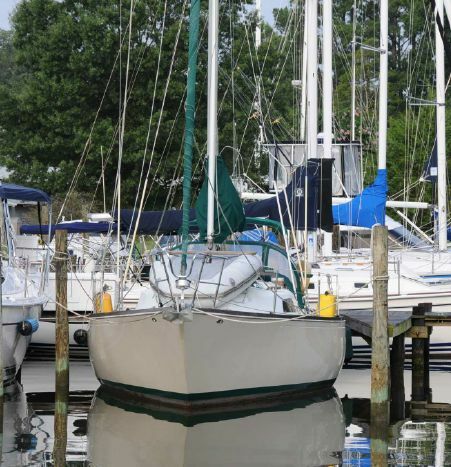 Prices for C&C Landfall 38s on the used market currently range from $30k to $70k.